If you have read my last post you know how late I was while posting something that was meant for the occasion of Bijoya Dashami and finally ended up posting just before Diwali. The last post was about salty crackers great for serving with tea or coffee. While making those diamond shaped crispy crackers I felt the need for something sweet to balance it. What else would be perfect but the Bengali special Narkel Naru or coconut laddu as the traditional counter part of nimki. 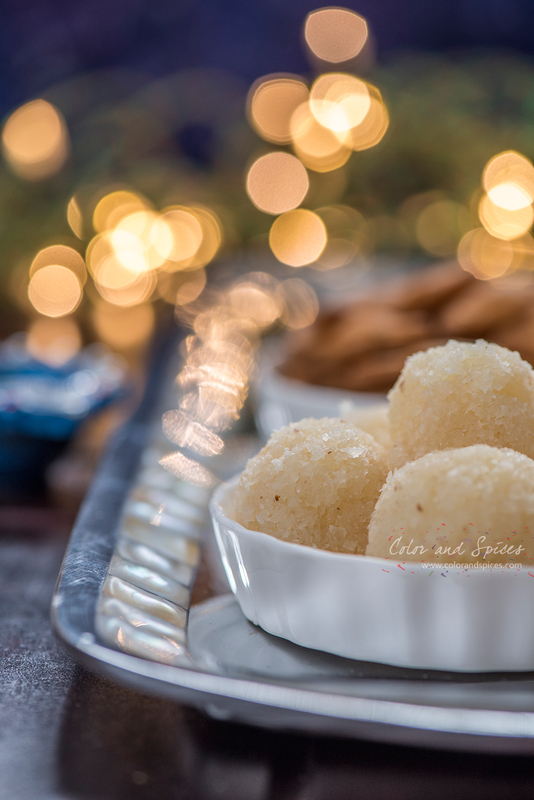 While preparing the naru or laddus just a day before Diwali I realized that I have always enjoyed the phase of getting ready for any event than the actual event. Outlining an event is an event in itself. Counting days, shopping, pairing jewellries with dresses and sarees, seeing the known old city gradually lit up to a gorgeous diva and the humdrum all over brings such joyous feeling. Something coming up with all it's potential is a feeling more intense than the actual happening and for that sometimes I get disappointed when an event didn't match my expectations. The con of being a day-dreamer. So coming back to the naru, I have seen my mother and aunts making a huge number of narus at home, during Durga Puja. A portion was meant to be served to the guests coming to Bijoya greeting and the rest used to be stored in big ceramic containers and was for snack time. I seldom make narkel narus at home. 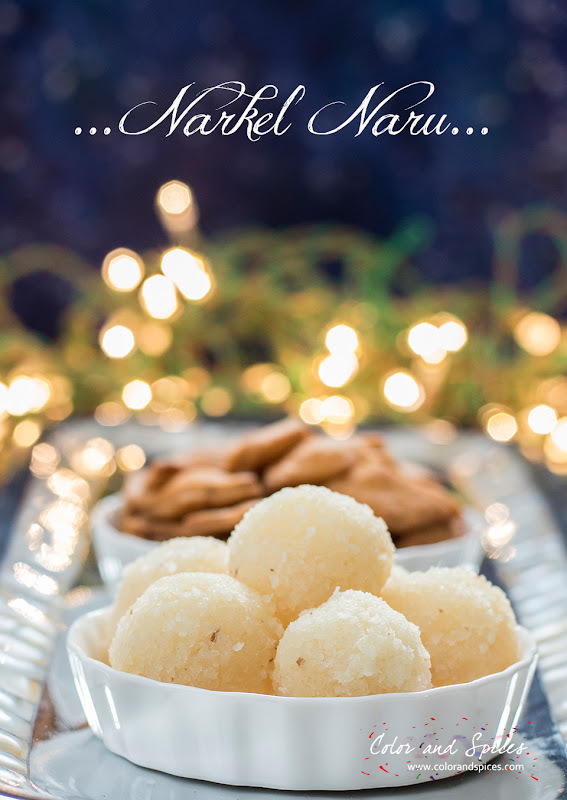 I always have my fair share of narkel narus as prasad (the food offered to any God or Goddess during Puja). 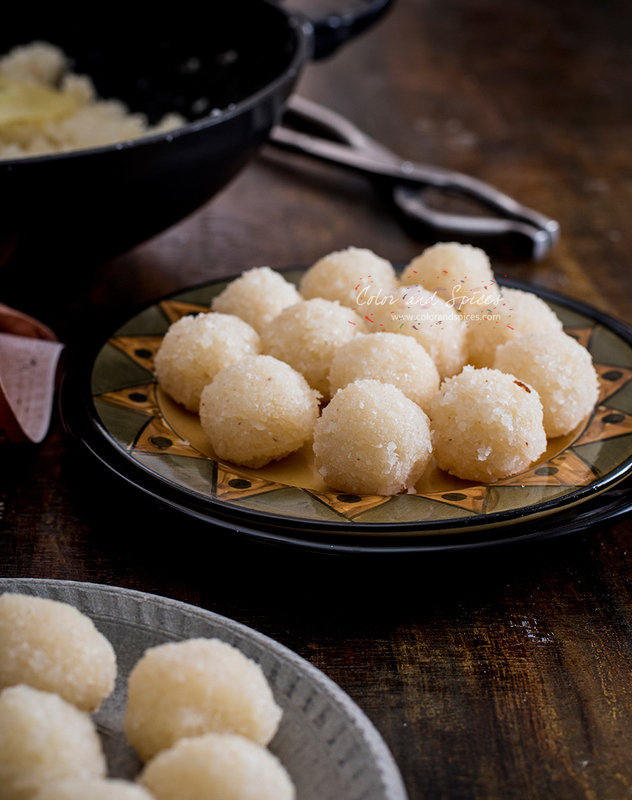 Narkel nadu is made from freshly grated coconut, cooked with either sugar or jaggery. I always find the sugar version trickier than the jaggery. My mother-in-law makes pristine white laddus with sugar and coconut. I learnt it from her. 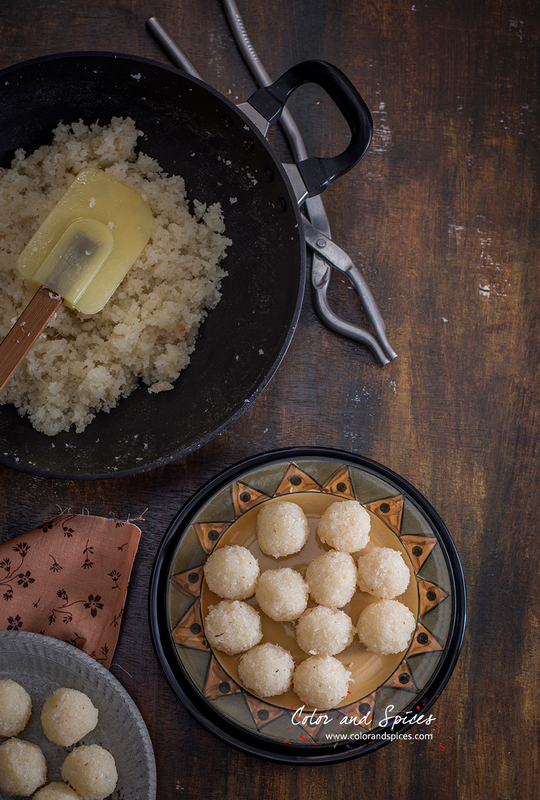 My grandmother used add a pinch of camphor to the sugar coconut laddus, giving it a heavenly flavor. This time I added my own twist adding a little condensed milk to the naru and it tasted so good. 1. Grate the coconut. 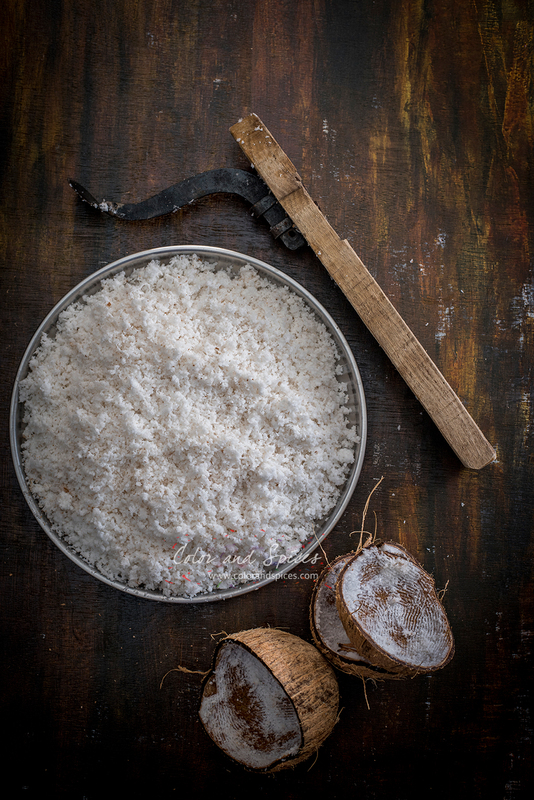 Freshly grated coconut makes better naru than frozen or desiccated coconut. 2. In a heavy bottom pan add sugar with few teaspoons of water. 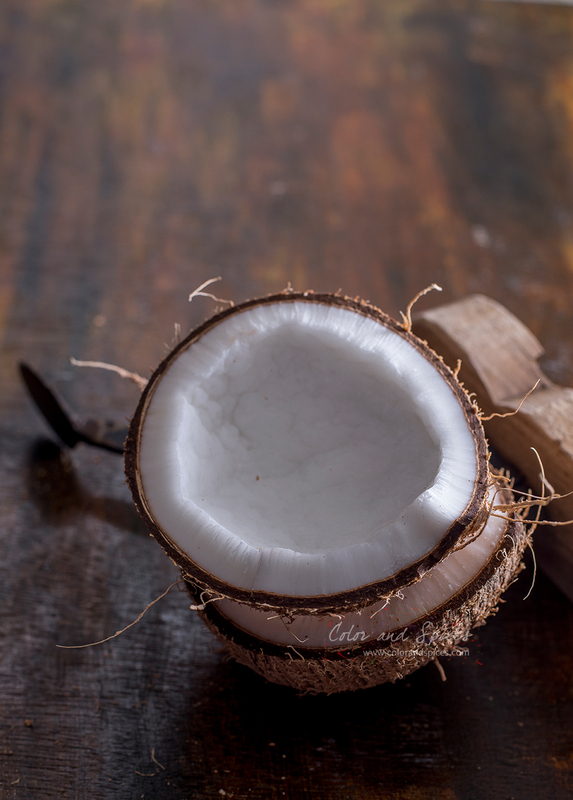 As the sugar melts add the coconut. Mix well, keep stirring over low heat for 7-8 min. 3. Add milkmaid (if using), mix well. Take a little coconut mixture and try to make rounds, if it starts to take shape switch off the heat. Let mixture cool down a bit. 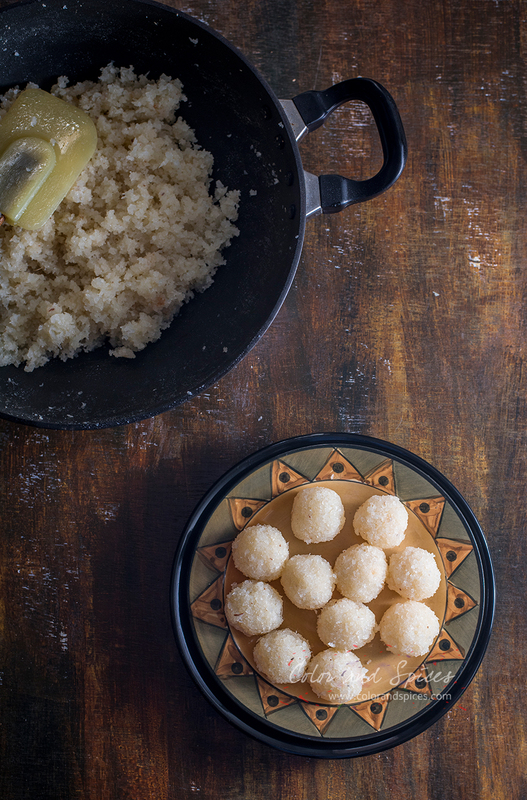 Make small laddus from it. Store in an air tight container. Wish you all a happy and safe Diwali. 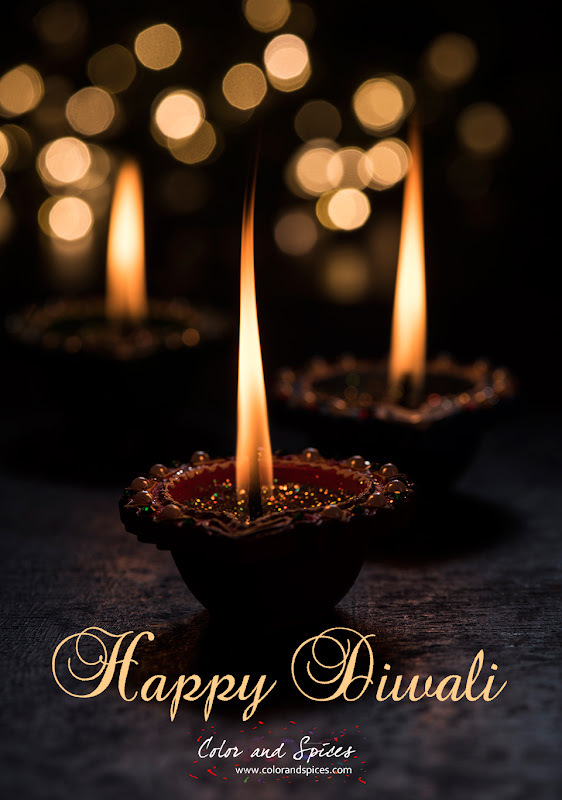 May the festival of light bring all the joy and happiness to you and your family.